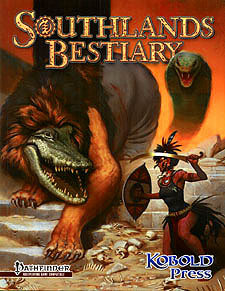 When northerners talk about the terrible monsters they've fought, the locals in the Southlands just laugh. The creatures that slither, flap, scuttle and rampage down here would eat those northern monsters for dinner - and still have room for a dessert of adventurers. The Southlands Bestiary brings you more than 100 colourful, deadly new foes for adventures in the deserts, savannahs and jungles. Within its pages you'll find emerald golems, venomous mummies, shapeshifting werelions, scorpion swarms, a new genie, peculiar statues, tosculi waspfolk, Southlands titans and much, much more! A must-have for Pathfinder Roleplaying Game GMs who want to run Arabian Nights or old-school pulp adventure games - or who want to surprise their players with all-new, original foes like none they've seen before!